The Gospels of the Easter Octave describe not just an event but even more so a journey. It is tempting to think that the disciples and apostles, having seen the risen Lord, were immediately confirmed in their faith, stripped of all doubt. That is not the case, however. Nearly all the resurrection accounts make it clear that although seeing the risen Lord was “mind-blowing,” it was only a beginning. As it is with any human experience, no matter how intense, encountering the risen Lord was something that the disciples needed to process. They needed to come to live its implications in stages. This description of a journey, of a coming to resurrection faith in stages, is presented in the resurrection accounts. We notice that the first awareness occurred “when it was still dark” and “at the rising of the sun.” It does not suddenly become fully light at dawn, however. Rather, the light manifests itself and increases over time; so it is with awareness of the resurrection. It begins to “dawn” on the disciples that He is Risen, truly; He has appeared to Simon. The first reports are sketchy and there is a lot of running around: Mary Magdalene to Peter and John, Peter and John to the tomb, the women to the rest of the apostles. Yes, there is an awful lot of running about! It is still dark, and the cobwebs of recent sleep aren’t completely gone; the light is just dawning, not yet at full strength. The disciples wonder what it all means and how it has changed/will change their lives. The answers to questions like these will require a journey; they are not to be answered in a mere moment. 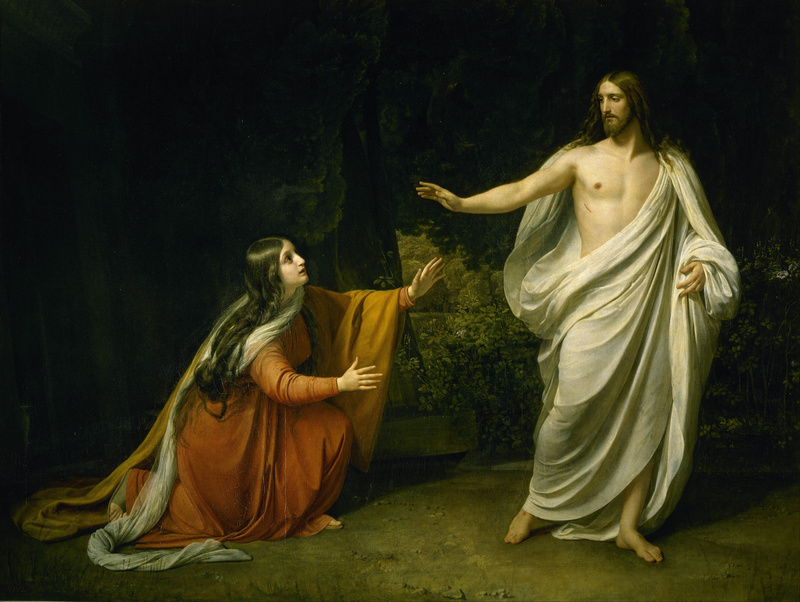 Mary Magdalene and the other Mary went away quickly from the tomb, fearful yet overjoyed (Matt 28:8). Yes, such a beautiful description: fearful yet overjoyed (φόβου καὶ χαρᾶς μεγάλης (phobou kai charas megans, which means fearful and of great joy))! What is one to make of all this? Yes, He is alive, but what does it mean? One’s life is changed, but how? One is filled with joy yet draws back in a kind of reverential fear at the unknown, the unexperienced. So we see the women, encountering the risen Jesus on the road, and they are fearful yet overjoyed. Again, while we might suppose that such an appearance would “seal the deal,” it is not that simple. Consider the following occurrences in the aftermath of the resurrection appearances and notice that a journey of sorts is required to make sense of it all. Mary Magdalene doesn’t even recognize Jesus at first. Her eyes must be adjusted by the faith that comes from hearing—in this case, hearing her name, Mary, spoken by Jesus. The disciples on the road to Emmaus don’t recognize Jesus at all until their eyes are opened in the breaking of the bread. When the apostles first see Jesus, they draw back, thinking He is a ghost. Jesus has to reassure them and clarify things for them. Simon Peter, even after seeing the Lord several times, falls away from his mission and announces to the others that he is going back to fishing. The Lord has to stand on the shore and call him anew from his commercial nets to the sacred shepherding of the Petrine ministry. Even after witnessing forty days of appearances by Jesus and having been summoned to the mountain of the ascension, some still doubt. After the ascension, the day of Pentecost still finds the apostles and disciples huddled together behind closed doors. It is only after the coming of the Holy Spirit that they are really empowered to go forth. Yes, there is more to experiencing the resurrection than merely seeing it. Faith comes by hearing and deepens by experience. They have to make a journey to resurrection life and so must we. Even for us who were born in the teaching of the resurrection, the truer and deeper meaning of it all is not something that can be learned simply by the reading the Catechism; it must be grasped through a journey. As a priest and disciple, I have both observed and experienced that Good Friday is powerful and moving for many people. Most of us know the cross; we have experienced its blows and its presence is quite real and plain to us. On Good Friday there are often tears shed during the Stations of the Cross, the Trae Horae, and the evening service of the Lord’s Passion. Come Easter Sunday, though, the experience seems less certain. People are joyful yet somewhat unsure of why or how. The joy of Easter seems more remote than the brooding presence of Good Friday or the gloomy silence of Holy Saturday. Although those days are unpleasant, they are familiar—Easter Sunday is different. What does it mean to rise from the dead? What are we to do in response? During Lent we fasted and undertook practices designed to focus us. Easter is more open and vacuous: Joy! Alleluia! Now what? It remains for us to lay hold of this new life that the Lord is offering. It is not enough to think of or see the resurrection as an event of the distant past. It is that, but it is so much more. It is new life for us. We rise with Christ. How and what does this mean? That is discovered through the journey. It is the deeper and more personal experience of the historical event that the Lord accomplished for us. He has raised us to new life. In my own journey I have had to move from the event itself to a deeper, more personal, truer experience of that event. I have come to experience the new life that Jesus died and rose to give me. I have seen sins put death and new graces come alive. I am more chaste, generous, joyful, hopeful, serene, and zealous. My mind is clearer; it is new. My priorities are in better order and I have clearer vision. My heart is more spacious. I have learned more deeply of God’s love and mercy for me and can thus show it more easily to others. Then arose Peter, and ran unto the sepulcher; and stooping down, he beheld the linen clothes laid by themselves, and departed, wondering in himself at that which was come to pass (Luke 24:12). In Sunday’s Gospel, the risen Lord appeared to the Apostles, who were gathered together in one place. The fact that they were gathered in one place is not without significance, for it is there that the Lord chose to appear to them. One of them was not there and thus missed the blessing of seeing and experiencing the risen Lord. It might be said that Thomas, the absent Apostle, blocked his blessing. Some people want Jesus without the Church. No can do. Jesus is found in His Church, among those who have gathered. There is surely joy to be found in a personal relationship with Jesus, but the Lord also announced a special presence whenever two or three are gathered in His name. It is essential for us to discover how Mass attendance is essential for us if we want to experience the healing and blessing of the Lord. 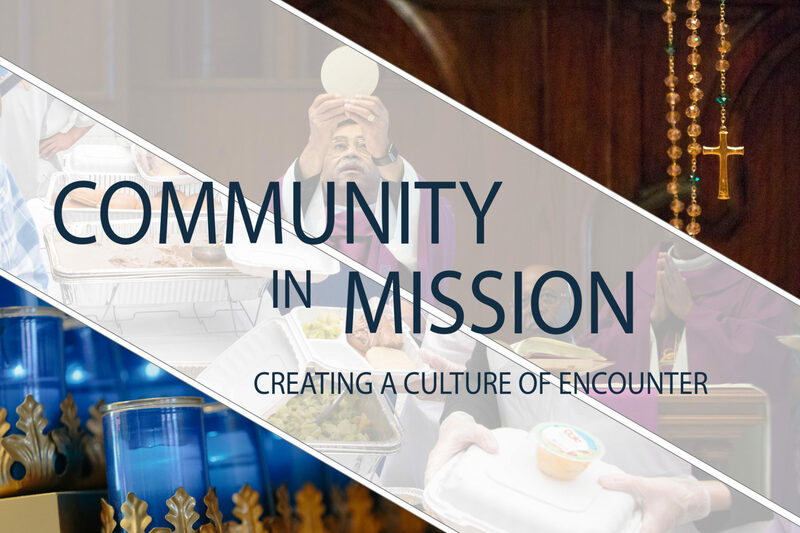 This Gospel has a lot to say to us about the need to gather together to find the Lord’s blessing in the community of the Church, in His Word, and in the sacraments. Let’s look at today’s Gospel in five stages. I. Fearful Fellowship – Notice how the text describes the gathering of the Apostles: On the evening of that first day of the week, when the doors were locked, where the disciples were, for fear of the Jews …. These men are frightened, but they are in the right place. It is Sunday, the first day of the week, and they have gathered together. The text says nothing about what they are doing, only that they have gathered, but in a sense this is all we need to know, for this will set the stage for blessings and for the presence of the Lord. These are men who need a blessing! The locked doors signify their fear of the Jewish authorities. One may also assume that they are discouraged, lacking in hope, and maybe even angry. They have experienced the earthquake that Jesus’ crucifixion was for them. Some of the women in their midst claim to have seen Him alive, but now it is night and they have heard of no other sightings. Thanks be to God, they have gathered. It is not uncommon for those who have “stuff” going on in their lives to retreat, withdraw, and even hide. This is probably the worst thing that one can do. It would seem that Thomas has taken this approach, though his absence is not explained. Their gathering is an essential part of the solution to everything that afflicts them. This gathering is the place in which their new hope, new hearts, and new minds will dawn. So it is for us, too, afflicted as we are in so many ways, troubled at some times and joyful at others. It is critical importance that we gather each Sunday, each first day of the week. In every Mass the Lord prepares blessings for us. I am powerfully aware that every Mass I celebrate, especially Sunday Mass, is a source of blessings for me. Not only does God instruct me with His Word and feed me with His Body and Blood, He also helps form me through the presence and praise of others: the people I have been privileged to serve. I don’t know where I’d be if it were not for the steady support of the people of God: their prayers, their praise, their witness, and their encouragement. Let us hold fast the confession of our hope without wavering, for He who promised is faithful; and let us consider how to stir up one another to love and good deeds, not neglecting to meet together, as is the habit of some, but encouraging one another; and all the more as you see the Day drawing near (Heb 10:22-25). So the Apostles are meeting together, encouraging one another. They are about to be blessed, but the blessing occurs only in the context of the gathering, so Thomas will miss it. This blessing is only for those who are there. So it is for us, too, who also have blessings waiting but only if we are present, gathered for Holy Mass. Don’t block your blessings! Suddenly there is a completely new reality, a new hope, a new vision. Note that there is also a new serenity, a peace, a shalom. Not only do they see and come to experience an entirely new reality, they also receive an inner peace. Observe again that this is only for those who are present. This is a basic purpose of the gathering we call the Sacred Liturgy. It is here that we are invited to encounter the living Lord, who ministers to us and offers us peace. Through His Word, we are increasingly enabled to see things in a new way, one that gives us hope, clarity, and confidence. Our lives are reordered. Inwardly, too, a greater peace is meant to come upon us as the truth of this newer vision begins to transform us, giving us a new mind and heart. Looking to the altar, I draw confidence that the Lord has prepared a table for me in the sight of my enemies and my cup is overflowing (Ps 23). The Eucharist is thus the sign of our victory and our election. As we receive the Body and the Blood of the Lord, we are gradually transformed into the very likeness of Christ. Is this your experience of the gathering we call the Mass? Is it a transformative reality or just a tedious ritual? As for me, I can say that I am being changed, transformed into a new man, into Christ, by this weekly—indeed daily—gathering we call the Mass. I have seen my mind and heart changed and renewed. I see things more clearly and have greater hope, joy, and serenity. I cannot imagine what my life would be like were it not for this gathering of the Holy Sacrifice of the Mass, where Jesus is present to me and says, “Shalom, peace be with you.” Over the years, I am a changed man. Yes, the Mass works. It transforms; it gives a new mind and heart. Don’t block your blessings; be there every Sunday. In this remarkable moment, the Lord gives the Apostles the power to forgive sin. Note that He is not simply giving them the ability to announce that we are forgiven; He is giving them the juridical power to forgive or in certain cases to withhold/delay forgiveness. This is extraordinary! Not only has He given this authority to men (cf Matt 9:8), He has given it to the very men who abandoned Him (with the exception of John) at His crucifixion. These are men who are well aware of their shortcomings. Perhaps it is only because Jesus knows of their awareness that He can truly trust them with such power. Also many of those who were now believers came, confessing and divulging their practices (Acts 19:18). Is any one of you sick? He should call the presbyters of the church to pray over him and anoint him with oil in the name of the Lord. And the prayer offered in faith will make the sick person well; the Lord will raise him up. If he has sinned, he will be forgiven. Therefore, confess your sins to one another and pray for each other so that you may be healed. The prayer of a righteous man is powerful and effective (James 5:14-16). Many consider it sufficient to speak to God privately about their sins, but the Scriptures instruct us away from such a solitary notion and bid us to approach the Church. The Lord gives the Apostles the authority to adjudicate and then to absolve or retain sins, but this presupposes that someone has first approached them for such absolution. St. Paul was approached by the believers in Ephesus, who made open declaration of their sins. The Book of James also places the forgiveness of sins in the context of the calling of the presbyters, the priests of the Church, and sees this as the fulfillment of this passage: declare your sins to one another … the prayer of the righteous man has great power (James 5:16). Thus, again, there is a communal context for blessing, not merely a private one. I have written more on the biblical roots of Confession here: The Sacrament of Confession. First, he is not with the other Apostles on resurrection evening, thus he misses the blessing of seeing and experiencing the resurrection and the Lord. Second, Thomas exhibits faltering fellowship by refusing to believe the testimony of the Church that the Lord has risen. One of the most problematic aspects of many people’s faith is that they do not understand that the Church is an object of faith. In the Creed every Sunday we profess to believe in God the Father and in Jesus Christ, His only Son, our Lord, and to believe in the Holy Spirit, the Lord and giver of life. But we are not done yet. We go on to say that we believe in one, holy, catholic, and apostolic Church. We know and believe what we do about Jesus Christ on the basis of what the Church hands on from the Apostles. Some say, “No, I believe in what the Bible says,” but the Bible is a book of the Church. God has given it to us through the Church who, by God’s grace, collected and compiled its contents and vouches for the veracity of the Scriptures. Without the Church there would be no Bible. Therefore, in rejecting the testimony of the Church, Thomas is breaking fellowship and refusing to believe in what the Church, established by Christ to speak in His name (e.g. Lk 24:48; Lk 10:16; Matt 18:17; Jn 14:26; 1 Tim 3:15; inter al. ), teaches. We, too, falter in our fellowship with the Church if we refuse to believe the testimony of the Church in matters of faith and morals. This a privatization of faith, a rejection of fellowship, and a refusal to gather with the Church and accept what she proclaims through her Scriptures, Tradition, and the catechism. Note that as long as Thomas is not present, he has blocked his blessings. He must return to gather with the others in order to overcome his struggle with the faith. V. Firmer Faith – Thomas then returns to fellowship with the other Apostles. Just as we do not know the reason for his absence, his return is also unexplained. Some may wish to chalk up his absence to some insignificant factor such as being busy, or in ill health, or some other largely neutral factor, but John seldom provides us detail for no reason. Further, Thomas does refuse to believe the testimony of the others, which is not a neutral fact. Praise God, Thomas is now back with the others and in the proper place for a blessing. Whatever his struggle with the faith, he has chosen to work it out in the context of fellowship with the Church. He has gathered with the others. Now comes the blessing. You know the story, but the point here is that regardless of our doubts and difficulties with the faith, we need to keep gathering with the Church. In some ways faith is like a stained glass window that is best appreciated from inside the church. From the outside there may seem very little about it that is beautiful. It may even look dirty and leaden, but once one ventures inside and adjusts to the light, one can see that the window radiates beauty. It is often this way with the faith. I have found that I could only really appreciate some of the more difficult teachings of the Church after years of fellowship and instruction by the Church, in the liturgy and in other ways. As my fellowship and communion have grown more intense, my faith has become clearer and more firm. Now that he is inside the room, Thomas sees the Lord. When he was outside, he did not see and so he doubted. The eyes of our faith see far more than our fleshly eyes, but in order to see and experience our blessings we must gather; we must be in the Church. Thomas found Him, but only when he gathered with the others. It is Christ’s will to gather us and unite us (Jn 17:21). Congregavit nos in unum Christi amor (The love of Christ has gathered us in one). Note: This Sunday is also Divine Mercy Sunday. I published a homily in the past (Perfect Mercy) with this focus. The gospels of the Easter Octave describe not just an event, but even more so, a journey. We are tempted to think that the disciples and apostles, having seen the risen Lord, were immediately confirmed in their faith and stripped of all doubt. But that is not the case. Nearly all of the resurrection accounts make it clear that although seeing the risen Lord was “mind-blowing,” it was still only a beginning. As it is with any human experience, no matter how intense, encountering the risen Lord was something that the disciples needed to process. They needed to come to live its implications in stages. This description of a journey, of a coming to resurrection faith in stages, is presented in the resurrection accounts. We notice that the first awareness occurred “when it was still dark” and “at the rising of the sun.” But as we know, it does not suddenly become fully light at dawn. Rather, the light manifests itself and increases over time. And so it is with the awareness of the resurrection. It begins to “dawn” on the disciples that He is Risen, truly; He has appeared to Simon. The first reports are murky and there is a lot of running around: Mary Magdalene to Peter and John, Peter and John to the tomb, the women to the rest of the apostles. Yes, there is an awful lot of running about! It is still dark and the “cobwebs” of recent sleep aren’t completely gone; the light is just dawning, not at full-noon strength. The disciples wonder what it all means and how it has changed/will change their lives. The answers to questions like this will require a journey; they are not to be answered in a mere moment. fearful yet overjoyed (Matt 28:8). Yes, such a beautiful description: fearful yet overjoyed (φόβου καὶ χαρᾶς μεγάλης (phobou kai charas megans = fearful and of great joy))! What is one to make of all this? He is alive! Yet what does this mean? One’s life is changed, but how? One is filled with joy, yet draws back in a kind of reverential fear at the unknown, the unexperienced. And so we see the women, encountering the risen Jesus on the road and they are fearful yet overjoyed. And again, while we might suppose that such an appearance would “seal the deal,” it is not that simple. Consider the following occurrences in the aftermath of the resurrection appearances and notice that a journey of sorts is required to make sense of it all. Mary Magdalene doesn’t even recognize Jesus at first, but has to have her eyes adjusted by the faith that comes from hearing—in this case hearing her name, Mary, spoken by Jesus. When the Apostles first see Jesus they draw back and think that they are seeing a ghost. He has to reassure them and clarify things for them. Even after witnessing forty days of appearances by Jesus and having been summoned to the mountain of the ascension, some see and believe but others still doubt. And after the ascension, the day of Pentecost still finds the apostles and disciples huddled behind closed doors. Only after the coming of the Holy Spirit are they really empowered to go forth. Yes, there is more to experiencing the resurrection than mere sight. Faith comes by hearing and deepens by experience. They have to make a journey to resurrection life and so must we. Even for us, who were born in the teaching of the resurrection, the truer and deeper meaning of it all is not something that can be supplied simply by the reading the Catechism; it is grasped through a journey we must make. As a priest and disciple, I have both observed and experienced that Good Friday is powerful and moving for many people. Most of us know the cross; we have experienced its blows and its presence is quite real and plain to us. On Good Friday there are often tears at the Stations of the Cross, the Trae Horae, and the evening service of the Lord’s Passion. But come Easter Sunday morning the experience seems less certain. People are joyful, but somewhat unsure of why or how. The joy of Easter seems more remote than the brooding presence of Good Friday or the gloomy silence of Holy Saturday. Though those days are unpleasant, they are familiar. But Easter Sunday is different. What does it mean to rise from the dead? What are we to do in response? During Lent we fasted and undertook practices to focus us. But Easter is more open and vacuous: Joy! Alleluia! Now what? It remains for us to lay hold of this new life that the Lord is offering to us. It is not enough to think of or see the resurrection as an event of two millennia ago. It is that, but it is so much more. It is new life for us. We rise with Christ. In my own journey I have had to move from the event itself to a deeper, personal, true experience of that event. I have come to experience the new life that Jesus died and rose to give me. I have seen sins put death and new graces come alive. I am more chaste, generous, joyful, hopeful, serene, and zealous. My mind is clearer; it is new. My priorities are in better order and I have clearer vision. My heart is more spacious. I have learned more deeply of God’s love and mercy for me, and can thus show it more to others. Yes, this is the journey to the new life that the Lord died and rose to give me. Good Friday and the cross are rather obvious to most of us, but Easter Sunday takes more time to fully comprehend. It requires a journey through which we, like the early disciples, progress from fear to faith, from darkness to light, from the sleepiness of the early morning to the alert faith of midday. It is the journey toward a true and lasting Easter. We never cease to be overjoyed, but our awe deepens from one that is bewildered in the face of the unknown to one that bespeaks knowing wonder at what the risen Lord is doing in our life. Our previously cringing fear becomes the holier fear of reverence and love. Peter now knows, even as he is known. For you and me, the journey of wonder, awe, and experience continues to unfold. I know more today than ever before (thank you, Lord), but so much more needs to unfold. It will, by God’s grace and in God’s time. God raised Jesus from the dead on the third day and granted that he be visible, not to all people, but to us, the witnesses chosen by God in advance, who ate and drank with him after he rose from the dead. He commissioned us to preach to the people and to testify that he is the one appointed by God as judge of the living and the dead (Acts 10:41 to 42). Note that Jesus did not appear openly to all but rather only to some. Why is this? It is so different from what most of us would do. If I were God (and it is very good for you that I am not), I would rise from the dead very dramatically. Perhaps I would summon people to my tomb with trumpet blasts and then emerge amid great fanfare (including a multitude of angels), inspiring awe and striking fear in the hearts of the enemies who had killed me. Or maybe I would ride down on a lightning bolt right into the temple precincts and then go up to the high priest and tell him to seek other employment. Surely to accomplish such a feat would be an event that would never be forgotten! It would draw many to faith, would it not? And yet the Lord does none of this! Not only did He appear only to some after His resurrection, but the actual dramatic moment of the resurrection itself seems to have been witnessed by no one at all. Instead of emerging from the tomb in broad daylight to the sound of trumpets, the Lord seems to have come forth before dawn to the sound of nothing but crickets chirping. Although St. Matthew mentions a great earthquake causing the rolling back of the stone and the guards stunned into unconsciousness, it seems that Jesus had already risen from the dead before the stone was rolled back. Such a hidden event! It was the greatest event the world has ever known, and yet it was hidden from human eyes. No, this is not our way at all; Cecil B. DeMille would not be pleased. One is the appearance to Peter. It would seem that the Lord appeared to Peter before appearing to the other apostles on that first resurrection evening. For when the two disciples return from Emmaus they are greeted with the acclamation, The Lord has truly been raised, he has appeared to Simon (Luke 24:34). Shortly thereafter, the Lord appears to ten of the apostles, along with some of the disciples. Why is there so little information about this appearance to Simon Peter? We are told in great detail about a conversation between Jesus and Peter two weeks later in Galilee (John 21), but of this first appearance in Jerusalem we get only this passing reference. In a certain sense it is a very significant appearance because it elevates the resurrection from just “some news” that the women were sharing, to the apostolic proclamation, the Lord has truly been raised. What moves it from rumor to fact? The difference is that he has appeared to Simon. Here is a kind of early and seminal act of the Petrine office and the Magisterium! But of this crucial apparition, no details are supplied. He appeared to Cephas, then to the twelve. After that He appeared to more than five hundred brethren at one time, most of whom remain until now, but some have fallen asleep (1 Cor 15:5-6). This is an amazing appearance; it’s not to two or three, or even to a dozen, but to five hundred at once. And yet no details are supplied. Where did it happen? When? For how long? What did the Lord say? What did He do? Silence. And then there are the resurrection appearances that never happened (but to worldly minds should have): Jesus’ appearance to His accusers and persecutors, to Caiaphas, to the Sanhedrin, to Pilate, and to all who jeered at Him as He hung on the cross. Surely they deserved a good dressing down—and they probably could’ve used it. Who knows, maybe they would have fallen to their knees and converted on the spot; maybe they would have worshiped Jesus. Such are my thoughts on the strange and hidden quality of the resurrection. Why so hidden, why so selective an audience? Ultimately, I cannot say why; I can only venture a guess, a kind of theological hunch, if you will. My speculation is rooted in the identity of God: God is love (1 Jn 4:16). Love is not merely something God does, nor is it just one of His many attributes. Scripture says that God is love. And it is the nature of true love (as opposed to lust) to woo the beloved, to invite rather than overwhelm, importune, force, or coerce. The lover wants to be loved, but to force the beloved to love or to overwhelm the cherished into a fearful love would mean not receiving true love in return. It is in the nature of Satan to pressure, tempt, and overwhelm, in order to coerce us into sin. Satan is loud and loves to use fear as a motivator. By contrast, God whispers. He calls us and gently draws us in. He supplies grace and evidence but does not overwhelm us with fearsome or noisy events. He is the still, small voice that Elijah heard after the fire and the earthquake (1 Kings 19:12). He is the One who has written His name in our hearts and whispers there quietly: Seek always the face of the Lord (1 Chron 16:11). At times He does allow our life to be shaken a bit, but even then it is more often something that He allows rather than directly causes. God is not interested in loud, flashy entrances or in humiliating His opponents. He does not have a big ego. Even if He chose to compel the Temple leadership to worship Him by using shock and awe, it is unlikely that their faith response would be genuine. Faith that needs to see isn’t really faith; one doesn’t need faith to believe what he can plainly see with his own eyes. Thus the Lord does rise from the dead and He does supply evidence to witnesses who had faith—at least enough faith to be rewarded. He then sends these eyewitnesses, supplies His graces, and gives us other evidence so that we can believe and love. But none of this is done in a way that overwhelms us or forces us to believe. God is love, and love seeks a free and faithful response. The hiddenness of the resurrection is an example of tender love. There’s only so much that the human person can take. So the Lord rises quietly and appears (but only briefly) to some and then seems to withdraw—almost as if respectfully giving them time to process what they have experienced. He gives them time to deepen their faith and to come to terms with what was, for them, a completely new reality, one that would change their lives forever. How different this is from the way we operate! So many of us think in terms of power, fame, glory, vindication, conquest, and so forth. How different God is! He is so often tender, hidden, and whispering. He doesn’t need to get “credit” for everything He does. He doesn’t need to crush His enemies. Rather, ruing the day on which their “no” might become a forever “no,” He works to win their love, always hoping for their conversion. Until then, He is always calling, willing, and giving grace. His mercies how tender, how firm to the end, our maker, defender, redeemer, and friend. Why was the resurrection so hidden? God is love. And love woos, it does not wound. It invites, it does not incite. It calls, it does not crush. It respects, it does not rule or seek revenge. Yes, God is love. Listen! My beloved! There he stands behind our wall, gazing through the windows, peering through the lattice … [He speaks to her and says], “Arise, my darling, my beautiful one, come with me” (Song 2:9-10). In this homily I reflect on the Emmaus Gospel (Luke 24:13-35) as a resurrection account, focusing on the journey of the two disciples out of darkness and into Easter light. (It is also clear that this whole Gospel account is a Mass, through and through, and I reflected on that aspect in another homily, available here: The Not-so-hidden Mass on the Road to Emmaus). But on this Easter day, let’s focus on the journey of these two disciples in four stages, watching how their journey gets lighter and brighter as they go. As the gospel scene opens, we see two people: one named Cleopas and the other not named. Perhaps the other disciple is you. Though it may be midday, they are experiencing a great darkness. Let’s consider their condition in four ways. They are Unfocused – As the curtain rises, we see these two, dejected and literally disoriented (they are traveling in the wrong direction, away from Jerusalem). It’s never a good idea to have Jerusalem behind you. Jerusalem is spiritual East, (oriens is the Latin word for east). Hence they are “dis-oriens,” disoriented; their focus is wrong. They are turned toward the west, toward darkness, away from the light and the resurrection. So, too, for some (perhaps many) today whose focus is worldly and westward, rather than heavenly and eastward, toward spiritual Jerusalem. The second reading today says, Since you have been raised to new life with Christ, seek those things that are above, where Christ is seated at the right hand of God (Col 3:1). They are Unaware – Jesus joins them and walks along with them. But the text says that their eyes were prevented from recognizing Him. We too quickly assume that it is the Lord who is preventing them. More likely, however, it is their sorrow or lack of faith that prevents them. The text describes them as looking downcast. This may speak to their sorrow, but it also indicates a certain lack of awareness and attention. Sometimes we are so busy looking down that we forget to look up and remember the heavenly glory that should ever be our true focus. Psalm 121:1 says, I will lift up mine eyes unto the hills, from whence cometh my help. Were they to lift their eyes from their downcast state, they might become aware of who it is that is speaking to them! Instead, they are downcast and hence unaware of the saving presence of the very Lord they lament. They are Unbelieving – They are well aware of the testimony of many in the Church that Jesus was alive, risen from the dead. They also know that this is the third day, for they refer to it as such. But they are sinfully stubborn in that they disregard the news of His resurrection (from the women and the apostles) and are leaving town. This is despite Jesus’ repeated promises that He would rise on the third day, the very day they are departing Jerusalem. Yes, they are unbelieving; they disregard the evidence of the very thing promised. Too easily we can do the same, collapsing at the slightest misfortune despite the countless blessings of the Lord. They are uninstructed – And thus the Lord rebukes them as foolish for being slow to believe what the prophets had written. The Lord likely does not use the word “foolish” to mean stupid or bumbling (today’s connotation). Rather, He is probably using the meaning common at the time: uninstructed in biblical wisdom. Foolish usually meant unwise, out of touch with or uninstructed in the wisdom of God. Thus the Lord rebukes their forgetfulness of God’s wisdom, as set forth in the Holy Scriptures. They are thinking as men think, not as God (cf Mat 16:23) thinks; they are thinking in worldly ways not in the ways of wisdom. We, too, can easily fall prey to worldly thinking if we neglect the biblical texts and are slow of heart to believe what God teaches us therein. II. Decoding – “Was it not necessary that the Christ should suffer these things and enter into his glory?” Then beginning with Moses and all the prophets, he interpreted to them what referred to him in all the Scriptures. The Lord decodes the recent events by teaching them, from the Word of God, what had been set forth about the Messiah. And thus Jesus the Christ was fulfilling God’s plan. Nothing had gone wrong; nothing was out of control. The pride of Satan was defeated by the humble suffering of Christ; the disobedience of man was now replaced by the obedience of the God Man, Jesus. We are saved by the human decision of a divine person. And for us who are too easily dismayed by the apparent (and short-term) triumph of evil and injustice comes the decoding of history: the cross wins; it always wins. Although it remains a cross, for down through the ages the faithful experience suffering and injustice, it always wins. Sunday always comes and an eternal Sunday dawns one day for all of the faithful. No matter what you think is happening, this is what is really happening. The Paschal mystery decodes all history: the passion, death, and resurrection of Jesus Christ—this what is really happening. We are always carrying in our body the death of Jesus, so that the life of Jesus may also be manifested in our bodies (2 Cor 4:10). Jesus is the resurrection and the life and all who believe in Him will live. III. Disclosure – As they approached the village to which they were going, he gave the impression that he was going on farther. But they urged him, “Stay with us, for it is nearly evening and the day is almost over.” So he went in to stay with them. And it happened that, while he was with them at table, he took bread, said the blessing, broke it, and gave it to them. With that their eyes were opened and they recognized him, but he vanished from their sight. Despite the evening hour, it is gradually getting brighter. Their hearts have been stirred by this walk with the Lord, who though hidden, has addressed their burdens, given them hope, and supplied meaning to the recent painful events. The words of an old hymn come to mind: “My load gets lighter; my way gets brighter; walking up the King’s highway.” Something tells them that this must continue, that it must grow ever deeper. They ask the hidden Lord to stay. Meals in the ancient world were about more than food; they were also about relationships. Meals were both a sign and a cause of greater intimacy and depth in relationships. And this is to be no ordinary meal. Clearly this entire pericope has been a Mass, from the gathering of two or three, to the presence of the Lord, to the instruction in His Word, and now to the celebration of the Eucharist. The Lord took the bread, blessed it and broke and gave it to them. No Catholic can fail to hear the words of this familiar action and not realize that this is the Eucharist. And for us the purpose is the same: that our load gets lighter, that our way gets brighter, and that we grow more deeply related to the Lord, who saves us. It is in this context that the Lord’s fundamental disclosure Lord takes place. Their eyes are opened and they recognize Him in “the breaking of the Bread,” the ancient Christian description of the Holy Eucharist. Two sad and downcast disciples journey with the Lord. As their load gets lighter and their way gets brighter, they can finally the Lord, who has never abandoned them is now disclosed to them by faith, the Word of God, and the Sacrament. Is this how you experience the Mass and your Christian walk? IV. Declaration – Then they said to each other, “Were not our hearts burning within us while he spoke to us on the way and opened the Scriptures to us?” So they set out at once and returned to Jerusalem where they found gathered together the eleven and those with them who were saying, “The Lord has truly been raised and has appeared to Simon!” Then the two recounted what had taken place on the way and how he was made known to them in the breaking of bread. No one goes away from Jesus unchanged. These men, having experienced the Lord profoundly, are now changed. They reverse course; they are “reoriented.” They return to Jerusalem and to the Church, gathered. There, they share with the others the joy that they have experienced. Is this how you leave Mass each Sunday? Though it is now late in the evening, the spiritual darkness has cleared; the night is as bright as the day. Jesus is risen; they have seen the Lord. The declaration of the Church is clear: “The Lord has been truly raised!” If the Church ever stops being able to experience and declare this, we will no longer be the Church. But as it is, Christ has been raised, and this has been our declaration to an often skeptical, sad world. It is Easter and we have seen the journey of these two disciples out of darkness and into light. One was named Cleopas; are you the other unnamed disciple? How? What is your story? In this reflection it is worth considering how, in the context of what is essentially a liturgy, Jesus reorders and orients two disciples who have, in effect, lost their way. Through this liturgical encounter, Jesus gets these disciples moving in the right direction again. As such, we are taught that the Liturgy, especially the Mass, has a way of reordering our disordered lives and restoring our lost orientation. Let’s consider the problem for these two disciples (who are us) and also the solution employed by the Lord. The Problem – Simply put, these disciples are walking in the wrong direction. They are headed away from Jerusalem, away from the resurrection, away from the gathered Church, away from the good news. The text says that these disciples were going to a village seven miles from Jerusalem called Emmaus (Lk 24:13). One of them is named Cleopas. The other is unnamed, but if you are willing to accept it, the other disciple might as well be you. The journey would take about three hours at a steady walking pace (no 45 minute Mass here). We are told they have heard rumors that Jesus had been raised, but they discount the testimony of the women, and and head off into discouragement with their backs to the good news. Yes, simply stated, they are heading away from the light of Christ and His resurrection glory, away from hope, and deeper and deeper into the darkness with each step they take. Sure enough, the text describes them as “downcast.” Jesus will later describe them as slow to believe, even foolish. The Solution – It is to these disoriented, discouraged and disordered disciples that Jesus comes. Rather than simply appear to them and order them back to Jerusalem, Jesus engages them in an encounter that is both liturgical and sacramental, an encounter that will restore to them a proper orientation, a proper order. Mass – He gathers with them and inquires of their struggle, a kind of penitential rite. Having heard their struggle he reminds them of God’s word and both applies and interprets for them, a kind of Liturgy of the Word. They then intercede with him in the prayerful petition “stay with us, for the day grows dark and is nearly over,” a kind of prayer of the faithful. What follows can be described as nothing other than the Liturgy of the Eucharist. For the Lord takes the bread, blesses it, breaks it and gives it to them. And suddenly their eyes were opened and they recognize him in the Breaking of the Bread. Now having their gaze turned toward the Lord, their lives are changed, reordered, and, in a kind of Ite Missa est they rush out to tell others what and who they have seen and heard. So, note that their course is now reversed and they are heading full speed back to Jerusalem, back to the resurrection, to the Church gathered, back to hope, back to the good news and back the to the light. These disciples whose minds were disordered and whose hearts were disoriented, have now been reoriented, and their disordered and darkened minds have come to see and understand. Yes, despair has given way to hope, and joy has replaced downcast dispositions. The Lord has accomplished this for them through what is best described as a Liturgy, as a Mass. And what then of us? Can we who are faithful and attentive to the Mass and other Liturgies and Sacraments of the Church not also say that through them the Lord has ordered, reoriented and redirected our lives? I am surely a witness, and pray you are too, that through the Liturgy and Sacraments the Lord has given me a new mind and heart. He has reordered my disordered life, given me an increasingly proper focus and direction. His word has corrected error and lit up my darkened and disordered mind. His Sacraments have redirected my wayward heart, oriented me to the light, and back to the heavenly Jerusalem. This work must continue. Through the Liturgy the Lord must order our lives rightly and correct the course of our wayward hearts. At the heart of this reordering is that in the Liturgy we are turned toward God, we look outside ourselves and upward toward God. To turn toward God is to be properly oriented, and this orientation orders our lives rightly. Yes, all this through the Liturgy, just like at Emmaus, still more so now. This Blog post is a follow-up from yesterday’s blog. When we encounter the resurrection accounts in the New Testament we face a challenge in putting all the pieces together in a way that the sequence of the events flow in logical order. This is due to the fact that no one Gospel presents all, or even most of the data. Some of the data also seems to conflict. I tried to show in yesterday’s blog that these apparent conflicts are not true conflicts. Another problem with putting all the facts together in a coherent and reasonably complete manner is that the time line of the events is often unclear in some of the accounts. Luke and John are the clearest as to the time frame of the events they describe but Matthew and Luke given us very few parameters. Both Acts and Paul also supply data wherein the time frame is not always clear. A. Very early in the morning a group of several women, including Mary Magdalene, approach the tomb to complete burial customs on behalf of Jesus (Matt 28:1; Mk 16:1; Jn 20:1). B. They behold the tomb opened and are alarmed. D. The women who remain encounter an angel who declared to them that Jesus had risen and that they should tell this to the brethren (Mk 16:5; Lk 24:4; Matt 28:5). G. Meanwhile Peter and John have gone out to the tomb to investigate Mary’s claim. Mary Magdalene followed them back out to the tomb arriving before they left. Peter and John discover the tomb empty though they encounter no angel. John believes in the resurrection. Peter’s conclusion is not recorded. H. The other women have reported what the angels say to the Apostles. Peter and John have not yet returned and these remaining apostles are dismissive of the women’s story at first (Lk 24:9-11). II. The Afternoon and evening of day one. B. The two disciples returned that evening to Jerusalem and went to the Eleven. At first the eleven disbelieved them just as they had the women (Mk 16:13). Nevertheless they continue to relate what they had experienced. At some point Peter drew apart from the others (perhaps for a walk?) And the Lord appeared to Peter (APPEARANCE 4)(Lk 24:34; 1 Cor 15:5) who informed the other ten who then believed. Thus the disciples from Emmaus (still lingering with the apostles) were now told (perhaps by way of apology) that it was in indeed true that Jesus had risen (Lk 24:34). C. Almost at the same moment Jesus appears to the small gathering of apostles and the two disciples from Emmaus. (APPEARANCE 5) Thomas was absent (although the Lucan text describes the appearance as to “the eleven” this is probably just a euphemism for “the apostles” as a group) They are startled but Jesus reassures them and opens the scriptures to them (Lk 24:36ff). D. There is some debate as to whether he appeared to them a second time that night. The Johannine account has significantly different data about the appearance on the first Sunday evening from the Lucan account. Is it merely different data about the same account or is it a wholly separate appearance? It is not possible to say. Nevertheless since the data is so different we can call it (APPEARANCE 6) (John 20:19ff) though it is likely synonymous with appearance 5. A. There is no biblical data that Jesus appeared to them during the week that followed. The next account of the resurrection says, “Eight days later” namely the following Sunday. C. Were the apostles nervous that Jesus had not appeared again each day? Again we do not know, the data is simply silent as to what happened during this interlude. IV. One week later, Sunday two. A. The apostles received some instructions to return to Galilee (Mat 28:10; Mk 16:7) where they would see Jesus. Thus they spent some of the week journeying 60 miles to the north. This would have taken some time. We can imagine them making the trek north during the intervening days. A. The time frame of the next appearance is somewhat vague. John merely says “After this.” Likely it is a matter of days or a week at best. The scene is at the Sea of Galilee. Not all the Twelve are present. They have gone fishing and Jesus summons them from the lakeside. They come to shore and see him (APPEARANCE 8 ) . Peter has a poignant discussion with Jesus in this appearance and is commissioned to tend the flock of Christ (John 21). B. The Appearance to the 500. Of all the appearances you might think that this one would have been recorded in some detail since it was the most widely experienced appearance. Many accounts it seems would have existed and at least one would have made its way into the scriptures. Yet there is no account of it other than it did in fact happen. Paul records the fact of this appearance: 1Corinithians 15:6 Then he appeared to more than five hundred brethren at one time, most of whom are still alive, though some have fallen asleep. (APPEARANCE 9) Where did this take place. What was it like. What was the reaction? We simply do not know. Proof once again that the Bible is not a history book in the conventional sense. Rather it is a highly selective telling of what took place, not a complete account. The Bible makes no pretenses to be something it is not. It is quite clear that it is a selective book: (John 20:30). C. The Appearance to James. Here again we do not have a description of this appearance only a remark by Paul that it did in fact happen: 1Cor 15:7 Then he appeared to James. (APPEARANCE 10) The time frame is not clear. Only that it happened after the appearance to the five hundred and before the final appearance to the apostles. VII. The rest of the forty days. A. Jesus certainly had other on-going appearances with the disciples. Luke attests to this in Acts when he writes: Acts 1: 3 To them he presented himself alive after his passion by many proofs, appearing to them during forty days, and speaking of the kingdom of God. B. During this time there is perhaps the one appearance we can attribute to this time period as recorded by Matthew (28:16ff) and Mark (16:14ff). It takes place an “a mountaintop in Galilee.” Mark adds that they were reclining at table. For these notes this appearance (time frame uncertain) is referred to as (APPEARANCE 11) It is here that he give the great commission. Although Mark’s text may seem to imply that Jesus was taken up from this mountain, such a conclusion is rash since Mark only indicates that Jesus ascended only “after he had spoken to them” (Mk 16:19). A. After forty days of appearances and instructions we have a final account of the last appearance (APPEARANCE 12) wherein he led them out to a place near Bethany, gave them final instructions to wait in Jerusalem until the Holy Spirit was sent. And then he was taken up to heaven in their very sight. (Luke 24:50-53; Acts 1). So here is a possible and, if I do say so myself, likely chronological sequence of the resurrection appearances. It is a kind of synthesis that attempts to collect all the data and present it in a logical order. There are limits to what we can expect of the Scriptural account, and fitting perfectly into a time frame and logical sequence is not what the texts primarily propose to do. Yet such a chronological sequence can prove helpful and it is in that spirit that I present this. This video is a collection of the Johannine appearances that I stitched together and set to the Music of Mozart’s Regina Caeli. Making Sense of the Resurrection Accounts: Are there Discrepancies? When we read the various accounts of the Resurrection in the four Gospels, Acts and Pauline Epistles we can easily be puzzled by some apparent discrepancies in the details. The word “apparent” is important because some who wish to cast doubt on the historicity of the Resurrection often wish to make more of these differences than necessary. Many, if not most of the differences can be dealt with quite easily and we are able to ultimately stitch together a pretty clear account of the resurrection if we are disposed to do so. Sadly today, some are not. Some are downright hostile to the claim of the Church that Jesus rose. Others, many modern day Scripture Scholars among them, like to insist that the Scriptures are not history as we mean the term today (an exact chronological and comprehensive analysis of an event or era). Hence they like to leave the apparent discrepancies unresolved and consider attempts to resolve them as “simplistic” and “fundamentalist.” While I agree that the Scriptures do not convey history as modern histories do (for example they are selective, story based accounts rather than our modern journalistic approach to history), I will not concede that they are not historical. In fact they do convey what Jesus actually did and said. Hence apparent conflicts ought to be explored and explained. How many women went out to the tomb that morning, one (Jn 20:21) two (Matt 28:1), or three (Mk 16:1)? Did Magdalene alone go to just Peter and John (Jn 20) or did the several women go to the Apostles (Matt 28; Mk 16)? How many angels did they see there that morning, one (Matt 28:2; Mk 16:5) or two (Lk 24:4; Jn 20:12)? Did the women run to the other disciples and tell what they had seen (Mt 28:8; Lk 24:9) or did they say nothing out of fear (Mk 16:8)? Did Jesus see them first in Galilee (Mk 16:7; Mt 28:9) or in Jerusalem (Jn 20; Lk 24:36)? Among the Apostles, did he appear to Peter first (Lk 24:34), all eleven at once (Mt. 28:16), or the eleven minus Thomas (Jn 20:24)? Did Jesus appear to them in a room (Jn 20:19) or a mountaintop (Mt 28:16)? Lastly, did Jesus ascend on Easter Sunday (Lk 24:50-53; Mk 16:19) or forty days later (Acts 1:3,9)? At one level some react that some of these details are picky. Who cares really who many women went or how many angels? Perhaps but it does not seem wise to simply dismiss the differences this way. Some of the differences ARE quite significant. For example, did Jesus appear to them first in Jerusalem? Luke and John are quite clear that he did. But why then does Mark completely ignore this and have the angel instruct the women to have the disciples go to Galilee where they will see him? Now, as has been stated, these differences can be addressed in a thoughtful manner but they should not be simply dismissed as of no account. In what follows I propose to address these difference and give possible resolutions. I am also aware and expect to hear from some who consider any attempts to resolve these matters “simplistic.” But I and others who have pondered these matters are not simpletons and would prefer if those who might have a different explanation or view would avoid dismissive, demeaning or ad hominem argumentum. If something seems wrong state why and give evidence or an alternative point of view. So, on to possible solutions. How many women went out to the tomb that morning, one (John 20:21), two (Matt 28:1) or three (Mk 16:1) and how many angels were there, one (Mk 16:5, Mat 28:2) or two (Lk 24:4, Jn 20:12)? One solution here is to recall that neither John’s Gospel nor Matthew’s absolutely deny that three women went to the tomb that day. They simply do not mention three whereas Mark does. John especially wishes to focus on Mary Magdalene and may have found it unnecessary to mention the others. Additionally, Matthew and Mark’s mention of one angel need not be seen as an absolute denial that there were two as described in Luke and John. Another solution is simply to acknowledge the discrepancies in the accounts but underscore the fact that the number of women and the number of angels is not the central point. The point is that the tomb was discovered empty by one or several women and they were instructed to tell the apostles what they saw and heard. Matthew (28:8) and Luke (24:9) indicate that the women went and told the disciples of the empty tomb but Mark (16:8) says they were afraid and said nothing. True but in the verses that follow in the appendix to Mark’s own Gospel (Mk. 16:10) Mary Magdalene does in fact tell the apostles. Rather than conflicting with the other texts, Mark may merely supply additional detail about the startled nature of the women, that at first they were startled and said nothing but soon after went on, as Mark in fact says, a did tell the apostles. Mark (16:7) and Matthew (28:9) indicate, according to the angel’s instructions, that Jesus would see them in Galilee but Luke (24:36 and John 20) describe the first appearances in Jerusalem. In addressing this difference we must recall that the gospels are not written as chronological or complete histories. The evangelists selected events from among the many things Jesus said and did and may also have altered the order. John (20:30 & 21:25) explicitly states that his account is selective. Hence we ought not conclude that any one gospel completely details all the resurrection appearances. It is true Mark and Matthew speak only of appearances in Galilee. Thus these accounts might only include the angelic instructions to go to Galilee since that they did not intend to describe appearances elsewhere. In other words it is possible to speculate that the angelic instructions were more elaborate and included instructions as to being prepared to meet Jesus first in Jerusalem. Matthew and Mark however paired these details down in their accounts since they did not intend to include the Jerusalem appearances in their accounts. This may not satisfy our notions of historical accounts wherein we expect and want a complete accounting of all the details. But, as has already been noted the Scriptures simply do not record history in this way. Rather they are selective accounts that open windows on history but do not claim to exhaustively report it. Note also that Matthew and Mark are not clear as to the time frame of the appearances they describe. Luke and John however, set the first appearance in Jerusalem and are rather clear that the day is the same day as the resurrection. Hence we reasonably conclude that the first appearances took place in Jerusalem and later appearances took place in Galilee. In other words the Jerusalem appearances do not conflict with the Galilean appearances in any way. Rather they simply add details that Mark and Matthew, for reasons of their own, chose not to include. Such a conclusion is speculative to be sure. It does, however, help us to see that the accounts do not absolutely contradict each other. Among the Apostles, did Jesus appear to Peter first (Lk 24:34), all eleven at once (Mt. 28:16), or the eleven minus Thomas (Jn 20:24)? There seems to be a good case for the fact that the Lord appeared first to Peter even though we do not have a direct account of this appearance in the scriptures. The Gospel of Luke makes mention of it, And they [the disciples travelling to Emmaus] rose that same hour and returned to Jerusalem; and they found the eleven gathered together and those who were with them, who said, “The Lord has risen indeed, and has appeared to Simon!”(24:33-34). Paul also records it [The Lord] was raised the third day in accordance with the scriptures…he appeared to Cephas, then to the twelve. Then he appeared to more than five hundred brethren at one time…Then he appeared to James, then to all the apostles (1 Cor 15:3ff). So it seems a pretty good case can be made that Peter did see the risen Lord before the other apostles. This quote from Paul also helps us recall that the gospel accounts are selective in terms of which resurrection appearances they report. Thus, as we read the various accounts, we get from each of them only a part of the full picture (see John 20:30). According to Paul there were appearances to Peter, to five hundred disciples, and to James. The details of these appearances are left to our imagination. It also follows that we do not need to see the accounts of John and Matthew cited above as conflicting. They may well be describing different appearances. Did Jesus appear to them in a room (Jn 20:19) or a mountaintop (Mt 28:16)? Again, we need not place these texts at odds with one another. Most likely they are describing different appearances. Since the time frame of John is clear that the appearances in the upper room took place on Resurrection Sunday and then a week later we can presume that these appearances took place first. The mountaintop appearance was in Galilee and the time frame is not clear. It may have been days or weeks later. Did Jesus ascend on Easter Sunday (Lk 24:50-53; Mk 16:19) or forty days later (Acts 1:3,9)? At first glance the texts from Luke and Mark do seem to imply that the ascension was the same day as the resurrection. However, a closer look will show that they are rather vague as to the time frame. Mark begins the passage leading up to the ascension with the word “afterward.” How long after the previous appearance is uncertain. Luke’s passage is also vague regarding the time. However Acts (1:3,9) also written by Luke is quite specific that the time of the ascension was forty days later. Thus, Acts need not be seen to conflict with the gospel accounts; it merely supplies the details that are lacking in them. This case is made stronger when we note that Luke is generally accepted to be the author of both the Gospel of Luke and the Acts of the Apostles and it seems unlikely that Luke would directly contradict himself. So here then is a short tour of some of the apparent discrepancies and possible ways to resolve them. In the end we simply have to accept that the Gospels do not record history in the same systematic and strictly chronological manner we moderns prefer. But they DO record history. It is for us to accept the evidence and accounts as they are given. The fact is that to develop a precise time frame and blow by blow chronological description may not be fully possible. However, careful study of the texts can help somewhat in this regard. In tomorrow’s blog I would like to propose a somewhat chronological account that attempts to weave the many strands into one narrative. Such an attempt as we will see involves some speculation given the nature of ancient historical accounts. But it can help us to sort our the many details by trying to order them. So stay tuned for tomorrow. In this video Fr. Robert Barron does a good job of describing the sophistication that is necessary when approaching Scripture. Since the Bible is not A book but is rather a collection of books with many different genres we cannot simply read it all in the same way. We have to approach the scriptures on their own terms and understand the way they speak to us.